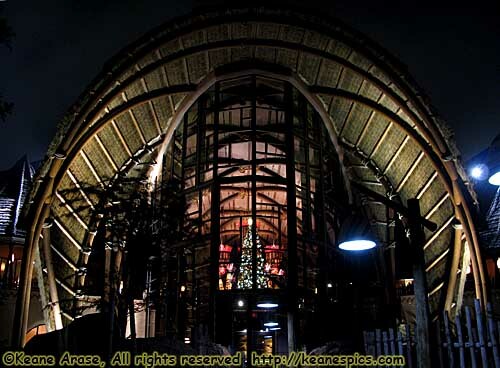 Animal Kingdom Lodge (Kidani Village) Atrium from the Sunset Savanna, December 2009. My first encounter with Kidani Village was in the rain. In December. (sigh.) But the World was dressed for Christmas, and even the weather didn't dampen any spirits. I was welcomed into the lobby by some Christmas Carolers, and enjoyed some Christmas tunes while checking in. No lines, no waiting. I like checking in that way. I was first struck at the size of the lobby. It was like seeing Sleeping Beauty Castle after seeing Cinderella Castle so many times. I've described Jambo House's atrium as Grand. Kidani's is Cozy. At the same time, I was pleased to see that the atrium was instantly recognizable as being part of Animal Kingdom Lodge. The biggest difference in the Atrium, is the lack of rooms (and corridors). Thus, if you're in one wing of the hotel on the third floor or higher, you have to go down to the lobby level to get to the other side. The gift shop is small, but has a selection of typical hotel food for the room. This recognition extends to the rest of the hotel as well. 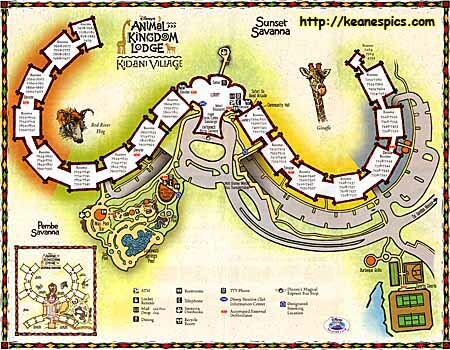 If you've stayed at Jambo House at some point, you'll feel right at home at Kidani. From the rugs, to the hall decor, to the room decor, to the views off your balcony into an animal savanna. It all says "Animal Kingdom Lodge". That's a good thing. Kidani is surrounded by two savannas. Sunset, which is shared with Jambo House, and the newest savanna, Pembe. The public viewing area for Pembe is by the Samawati Spring Pool area. I do like the pool area more here than at Jambo. It seems to be more sculpted into the landscape, and with the Savanna overlook and the kid's play area separating the pool from the hotel, is more a destination in itself. At Jambo, I felt like part of the display for the guests in the pool view rooms. The Rooms have HDTV's, with a box that allows you to connect to the TV via HDMI, VGA and standard video with stereo audio RCA connections. All the rooms are Villas. The studio I was in had a microwave, toaster; and larger 'fridge and a larger capacity coffee maker than a deluxe or moderate. In 2009, the biggest drawback I thought Kidani had was no breakfast service, nor counter service. The Mara in Jambo is the closest counter-service, with both Mara and Boma serving breakfast. I drove back and forth, and it wasn't that painful. (They now have a shuttle bus that runs between the resorts.) If you have a one or two bedroom villa, you'll have a kitchen, so you can at least cook something, and the store in Kidani's lobby has food for those who don't have a car available. End Animal Kingdom Lodge - Kidani Village.